Today I will introduce one more Vietnam popular destinations to tourists which is Sapa City. In reality, the local people have called this place is Sa Pả (It means sand area), but the expat call it Sapa. Sapa has Fansipan Mountain which is called the top of roof of Vietnam. It has 3,143m height. This mountain is the living area of various pine and animals such as wooden chicken, bear, monkey or chamois. Have you ever come to Thach Lam (Vân Nam, China). It is one of the best destination for tourists whenever they travel to China. 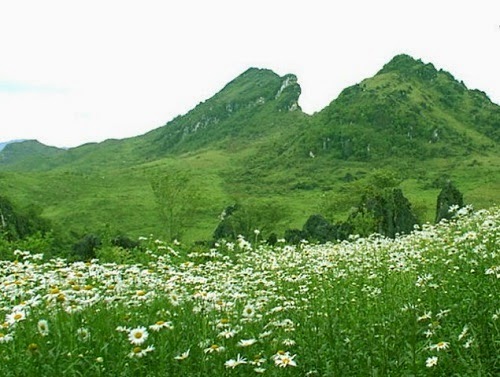 However, the visitors can see some similar paradise view and scenery of Thach Lam when they come to Ham Rong Mountain. In addition, this place is indeed a fruitful landscape of Sapa after it is embellished by human’s hand. The Sapa market is not similar with other market that the visitors have known. It is just opened on Sunday. Therefore, the local people who live far away the market have to begin on Saturday. This market has an interesting activity is that everybody sit and sing together around a campfire. They sing many songs of Mong, Dao which is some tribe of Vietnam at the night of Saturday. This activity is also a chance for young man and young girl meeting and dating. So, Sapa Market is called Love Market by many people. So, it attracts many local people and tourists come here and it now becomes one of Vietnam popular destinations. This cave is not big, but it has special rock which is seen similarity with one widow is holding a baby. Moreover, the cave contains many rocks look like mermaids and raspberry. If the visitors go inside the cave, they will have a chance to see some spectacular stalactites. After visiting the cave, the tourists can go to one village near there to enjoy some tribe’s culture. The visitors may see many waterfalls around the world, but they may not have seen the roaring water flows down, white foam roll like flowers. After nearly half an hour go over the winding road, breading the winding of mountain and hearingthe sound of thousands of birds. Therefore, the visitors usually come there to avoid the hot temperature. At the result, it makes this area become one of Vietnam popular destinations. Moreover, it will absolutely make visitors feel lightheadedness continuous drainage is lost. Sapa has four seasons in a year; especially the Silver waterfall area, summer is still chilly. If you come here, you do not enjoy the Com Lam Sapa, it means that you never come here. The reason is Com Lam Sapa is one of the most delicious rice in Vietnam. The rice is cook in one bamboo tube, and then the bamboo tube will be baked in the fire. Dissimilarity with other rice, the visitors can enjoy only the Com Lam Sapa not include with salt or other foods. To sum up, there stil have many other places in Sapa. However, I just want to introduce best detinations for you guys. It helps you save your time and can go other places to visit. Let's come and enjoy one of another Vietnam popular destinations, you will see many interesting there and has a good memory.